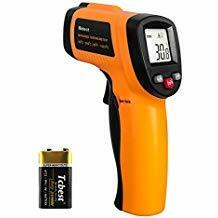 Descriptions:100% Brand new and high quality!Precise non-contact IR thermometer, safe and easy to use.Simply point to an object and read its temperature. 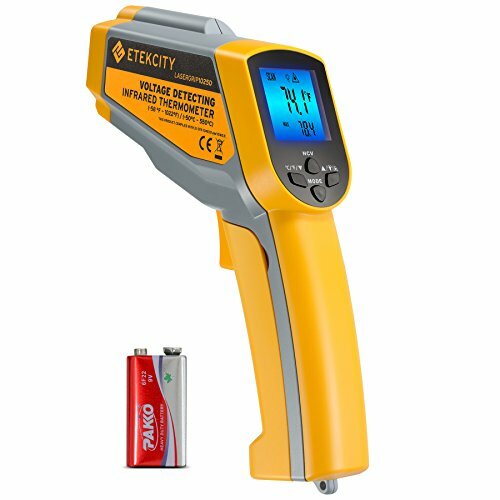 BACKLIGHT LCD SCREEN: Auto Shut-Off in 7 seconds to extend the battery life and features a low battery indicator.HANDLED and SAFE: Keep Your Hands Safe in This Amazingly Fast & Safe Way to Measure Temperature Without Surface Contact.Power & WARRANTY: It is powered by 2 x AAA battery (Included). U.S. FDA FCC, CE, ROHS approved. 1 Year Warranty. 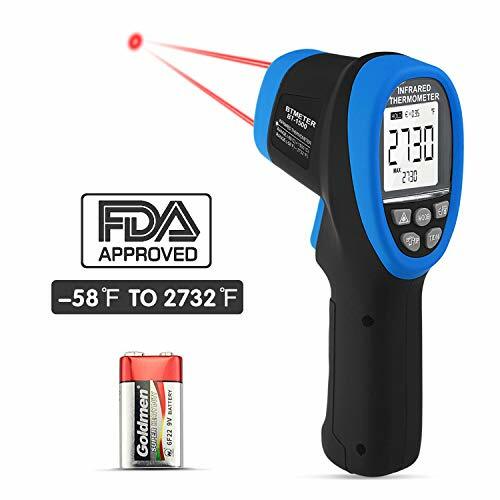 PARTYSAVING Non-Contact Infrared Thermometer Temperature Gun with Precision Laser Technology makes taking temperatures easier than ever. 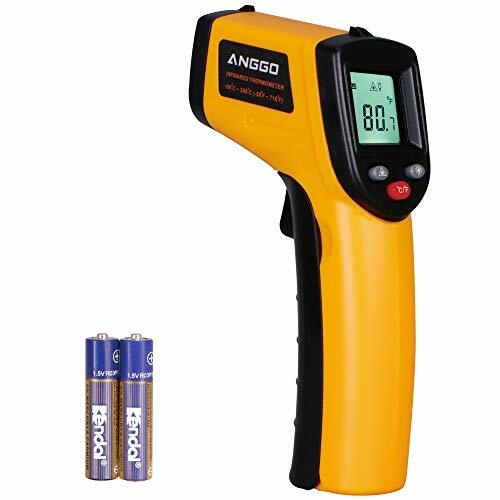 Contact free gun can be used to safely take the temperature for a variety of indoor and outdoor applications. Features - Suitable for a variety of applications including food, AC units and heating systems, automobile cooling systems, swimming pools, and more. - Low battery indicator: Warns you when the batteries are dying - Auto shut-off: Turns device off after 10-seconds of inactivity - Backlight display: Makes it easy to use during the day or at night. - Measures in Fahrenheit and Celsius: From -58? – 716? (-50? – 380?) 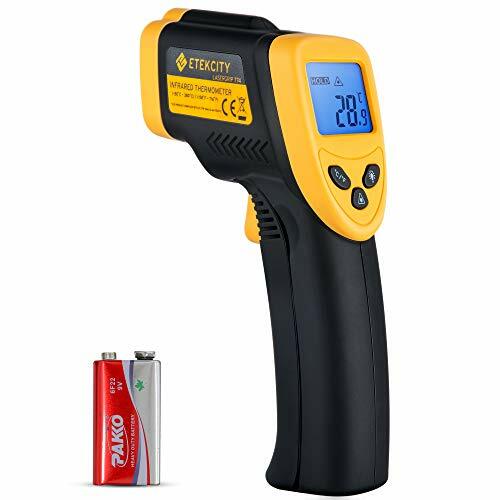 - Emissivity: Adjustable from 0.1 – 0.99 (Emissivity table included in instruction manual) Package Contents 1 x Infrared Thermometer 2 x AAA 1.5V Batteries 1 x Instruction Manual Warranty For any possible defective products, please contact us first, we will offer you a replacement or refund youWARNING: This product can expose you to chemicals, which are known to the State of California to cause birth defects or other reproductive harm. For more information go to www.P65Warnings.ca.gov. 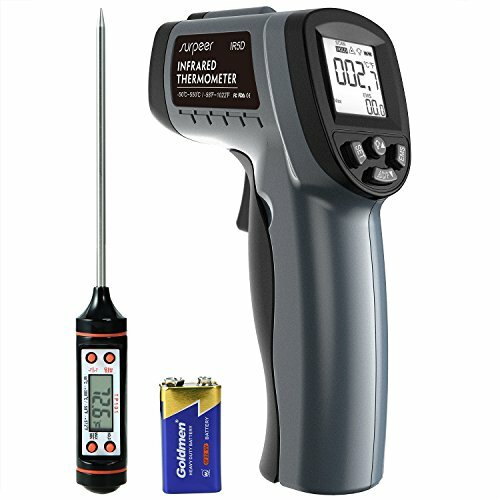 Features: Precise non-contact IR thermometerSimply point to an object and read its temperatureLaser sight allows accurate targetingConsist of optics, temperature sensor, signal amplifier, processing circuit and LCD displayLaser on/off switch, Auto power off & temperature data holdCelsius and Fahrenheit IndicatesOne-Handed operationLightweightSuitable for: hot water pipes, hot engine parts, cooking surfaces, hot tubes insulation, electrical connection, ballasts in electric lights, electric motors, bearings, wine coolers hot asphalt, swimming pools, fish tanks, hot & cold food products, heating air conditioning, etc. High quality with one year warranty. 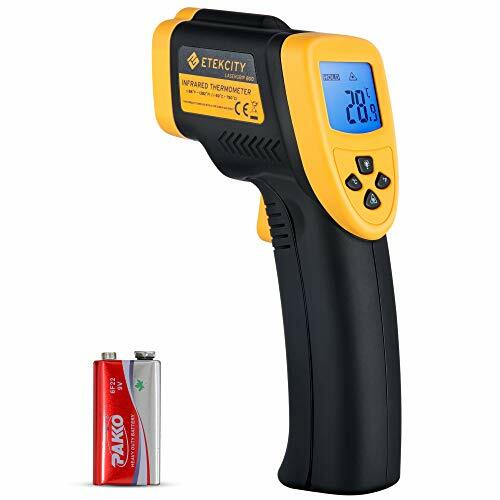 Package includes :1 x GM320 Infrared Thermometer1 x User ManualSpecification:Model: ST400Measurement range: -32-400℃ ( -25.6-752℉)Accuracy: +/- (25+2℃)Resolution: 0.1℃ 0.1℉Distance spot ratio: 12:1Emissivity: 0.95Spectral response: 5-14umResponse time: 500msec, 95% of readPower supply : 1 x 6F22 9V battery (Not included)Features: ℃/℉ Seleciton.Laser power: class 2 operationDisplay hold.Buzzing prompting.White LCD backlight.Auto power off.Low battery indication.DC 9V battery.Its suitable for hot water pipes, hot engine parts, cooking surfaces, hot tubes insulation, electrical connection, ballasts in electric lights, electric motors, bearings, wine coolers hot asphalt, swimming pools, fish tanks, hot & cold food products, heating air conditioning, etc. 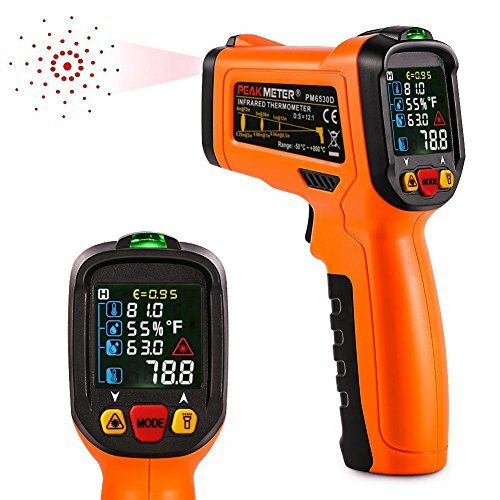 The eT650D Dual Laser Infrared Thermometer can be used to accurately and quickly measure surface temperatures, without making contact with the object you’re measuring. Use it in the kitchen for instant surface temperature measurements of food, pizza stones, oven walls, range top, frying pan or fryer oil, grill, refrigerator and freezer. Scan your home for insulation leaks, check the temperature of air conditioning and heating vents and water heater pipes. You can also use it for automotive diagnostics: check your cars cooling system, catalytic converter, brakes, and tires. 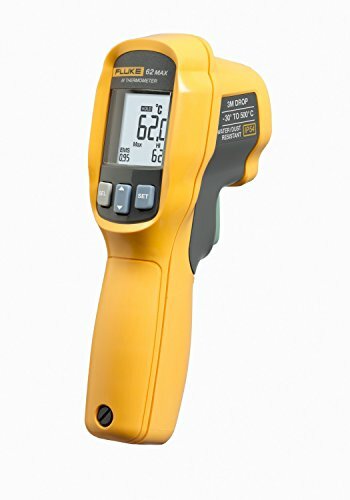 Or check the ambient temperature of chicken coops, terrariums, and reptile enclosures. The uses are endless.